Rowdy crowds once jammed Lizzie's Trail Inn for gambling, moonshine and 20-cent ham sandwiches. They left scuffs on the floor and a wealth of stories in Sierra Madre. 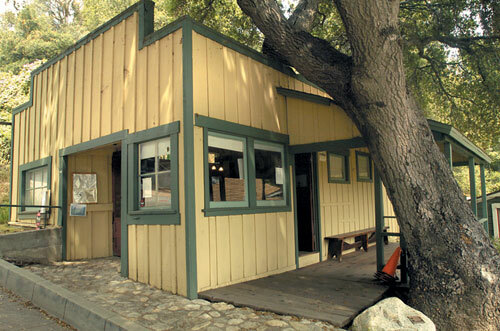 By turns a diner, a speakeasy and a vacant shack, Lizzie's Trail Inn now serves this quaint foothill city as a historical museum. A second museum sits next door in the Richardson House, built by one of the town's first residents. The two tiny cabins are perched on a high slope where the Mount Wilson trail begins. Lizzie's was built around 1895 to serve food to hikers. Crowds once braved the steep four-hour hike to peer through telescopes at the top of Mount Wilson. Regularly scheduled mule trains took supplies up to the peak, where intrepid hikers spent the night. When the streetcar line was extended to Sierra Madre in 1906, thousands arrived at the Mount Wilson Trail stop two blocks away to take in the sights. Over the years, the inn evolved into well-known nightspot. Dr. William White, one of Sierra Madre's many town historians, helped preserve the building and establish it as a museum in the 1990s. He was attracted to the landmark, he said, "Because you mention it and the old-timers just start to grin. They have stories that they want to tell you about." People came for dancing, to play slot machines and drink from the neighboring still. They also came for the food. A 1940s menu from the inn advertises a complete meal for $1.50. The museum is open only on Saturday mornings, from 10 a.m. to noon. It is at 187 Mira Monte Ave. A variety of books on local history and hiking are for sale, along with drinks and T-shirts. The Mount Wilson Trail is still heavily used by hikers.